Nestled on the eastern coast of the South Island, Christchurch is the largest city this side of the country. This buzzing metropolis continues to prove that it’s still a great campervan rental holiday destinations in New Zealand despite the major quakes that rocked it back in 2010 and 2011. Christchurch is often nicknamed as The Garden City, so if you love taking long walks around plants and nature, you’re in a for a treat. Spend a nice afternoon strolling around Hagley Park, the largest open space in the city. 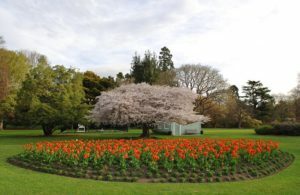 Within the park, you’ll find the famed Christchurch Botanic Gardens, where you can see hundreds of different plant species from all over the world. Want to sit back and relax while sightseeing and learning about Christchurch’s history? 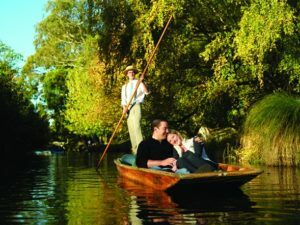 Go punting on the Avon River! Enjoy a tranquil boat ride along the river, which runs through the very heart of Christchurch. The operators, or punters, are usually dressed in period clothes and double as tour guides so you get to learn more about the city’s history as you take a cruise. If you prefer seeing the city from high up, ride the Christchurch Gondola, where you can take in a stunning 360-degree view of the city. Lying between Christchurch and the town of Lyttelton are the Port Hills. This magnificent range of hills is perfect for those who love hiking or biking. There are many paths and trails for you to explore. Don’t forget to bring a picnic basket so you can chill and watch the city come to life from the top of the hills. Take your campervan for a drive to the Banks Peninsula and experience the beautiful coastal town of Akaroa. 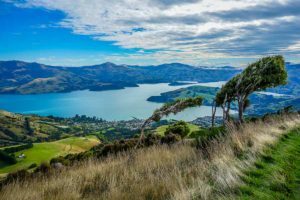 About 90 minutes away from Christchurch, Akaroa is full of historical attractions and natural wonders that’s sure to delight every kind of traveler. Akaroa is the country’s sole French settlement, so expect French culture, architecture and cuisine all around this little town. There’s also tons of outdoor adventures to be had: you can swim with dolphins, watch seal colonies, go paddle boarding or climb any of the town’s wonderful hiking trails. Self-confessed foodies will love the North Canterbury Food and Wine Trail. Located just a short 20 minutes north of Christchurch, this famous food and wine trail boasts of delectable offerings like fresh produce and superb wine. Enjoy fantastic food from the many restaurants and cafes around the area. 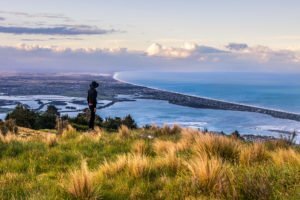 A campervan holiday in New Zealand is not complete without a trip to Christchurch. Explore this wonderful city and the rest of Canterbury region with Escape Rentals today.